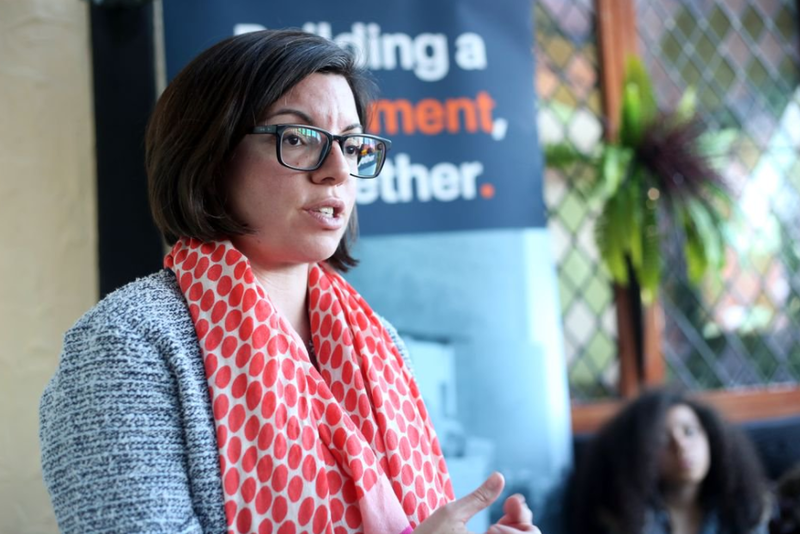 An interview with Niki Ashton, whose campaign for leadership of Canada's New Democratic Party has been rooted in a bold left-wing vision. The leadership race that was set in motion for Canada’s federal New Democratic Party after then-leader Thomas Mulcair was ousted at the party’s April 2016 convention is entering its home stretch. The cutoff point for new members to sign up to vote is August 17, with the final two debates soon after. By mid-October, the winner will be announced. In the 2012 leadership campaign, party members decided to play it safe and go with the centrist Mulcair, who was seen as the person who could lead the NDP into government for the first time at the federal level. But Trudeaumania came along in 2015, and the NDP went from the second largest party in parliament back to its traditional third-party status. That result was seen by many NDP supporters as a result of a very cautious campaign in which the NDP promised to balance the budget and did not attack the Trans-Pacific Partnership during the campaign’s opening days. Trudeau, meanwhile, was able to outflank the NDP from the left by promising deficit spending to revive a stagnant economy. The NDP finds itself at a political crossroads like so many other social-democratic labor parties around the world. But with the Trudeau government breaking so many of its promises, there is a real opening for a left alternative. Manitoba MP Niki Ashton is proposing such an alternative. Running for the party’s leadership seat, she’s cited Bernie Sanders and Jeremy Corbyn as important developments for the Left globally. At the launch of her campaign, she quickly came out to support policies like abolishing tuition fees for higher education and opposition to oil pipelines — the kind of policies that galvanized Sanders supporters. Gerard Di Trolio, an editor at rankandfile.ca, spoke to Ashton about how the NDP ended up in its current situation, her beliefs, and her policies that would shift the NDP leftwards and reconnect with its democratic-socialist origins. How did the NDP get to where it is today, with another leadership race in 2017 only five years after the last one? We lost significant ground in the 2015 election. We strayed away from NDP principles and were disconnected from the grassroots including our activists as well as social movements. In the last federal election, we allowed the Liberals to “out-left” us. The Liberals did put forward a progressive and inspiring agenda of sorts, but of course they’ve gone on to break many of the key promises that they made to progressive Canadians — whereas we took a much more centrist road, obviously the commitment to and doubling down on a balanced budget. Overall, it was a very cautious campaign that was not in tune with where a lot of our activists are. You have campaigned for Bernie Sanders and you’ve signaled support for Jeremy Corbyn and even Syriza. What sort of lessons have you learned from these resurgent left campaigns? I’m deeply inspired by the work of progressive-left candidates and movements around the world. Whether Sanders or Corbyn, they’ve inspired many of my generation (I’m an older millennial) because they spoke clearly about the challenges we face, particularly growing inequality and climate change, and rejected the neoliberal status quo on how to tackle the biggest challenges of our time. They put forward bold ideas, whether it’s taxing the rich, talking clearly about nationalization, or commitment to free tuition, and they’ve worked with social movements and activists on the ground. I had a bit of time to connect with the Sanders campaign, and it was very evident to me that the connections to social movements are incredibly strong. There was a lot of inspiration taken from the grassroots when it came to running the national campaign. In terms of Syriza: my first language is Greek, that’s my background. Through my connection with Greece, I could see the way in which so many, and again including many young people, were turning to a much more progressive vision, rejecting the status quo of old government parties to try to bring about change at a time of crisis. During the leadership candidates’ debate in Regina, there was a question asked about the Regina Manifesto (the founding document of the NDP’s predecessor, the Co-operative Commonwealth Federation). It was a socialist document and you mentioned how it still had relevance today. What does socialism mean to you? To me it means putting people before profit. Recognizing that dignity, equality, and justice for people is paramount, not corporate greed or profit margins. I obviously believe in the power of the collective, both in terms of movements but also in terms of ownership, and I believe that is a key way for us to not just tackle inequality but achieve greater well-being through establishing public ownership in key sectors. That’s why that I’m proud that our campaign is pushing things like postal banking and calling for a crown corporation that would be involved in both the buying and negotiation of pharmaceutical prices, and, in the energy sector, the creation of a crown corporation responsible for directing a green transition. The neoliberal mantra that greater wealth will come from privatization, deregulation, and austerity has clearly been proven wrong. We need to take a left turn and be re-inspired by our own roots within the party, but also take inspiration from other leaders around the world like Sanders and Corbyn who have used the word “socialism” on a regular basis. Justin Trudeau has been getting a lot of attention and has been met with protests over his poor handling of indigenous issues. Reconciliation is a very long-term process, but what immediate steps would you take when in power to move forward on it? When we’re talking about the pursuit of justice in Canada, the achievement of indigenous justice is fundamental. I’ve worked with many First Nations — there are forty-one nations in my constituency — and have been inspired by the work of so many activists on the front lines, whether it’s the struggles against resource extraction or for human rights. So much of the resistance to neoliberalism is from indigenous communities. We made it very clear in our campaign that a key step going forward is the adoption and implementation of the United Nations Declaration on the Rights of Indigenous Peoples. That’s a key framework in terms of achieving justice. It’s not just about health care and education, but also about extraction. Our campaign has made it clear that if we’re talking about resource extraction — pipelines and other projects — there must be consultation and, very importantly, consent from indigenous communities. Otherwise these projects cannot go forward. On social media, I noticed you gave a glowing review to the book False Choices , edited by Liza Featherstone, which is a socialist-feminist critique of Hillary Clinton’s politics. How would you define your conception of feminism compared to Hillary Clinton’s? That was a great book. In the campaign, I’ve made it very clear that I subscribe to an intersectional feminism, recognizing that the barriers that women face, that various people face based on gender, always intersects with class, with race, with ability, with sexual orientation and sexual identity. It’s a rejection of what is known as “white feminism,” which is embodied by much of what Hillary Clinton and some of her peers have stood for. Think of the way Gloria Steinem castigated young women for supporting Bernie Sanders and saying they supported him because that’s where the boys were. False Choices made it very clear that if we’re going to be feminists, we need to apply a feminist lens to everything, from crime policy to foreign policy. I’ve been very critical of Justin Trudeau’s claim that he’s a feminist. You can’t be a feminist prime minister and the second largest arms dealer in the Middle East, selling arms to the Saudi regime that targets women and LGBTQ folks. And I very much oppose the bombing of Syria that Trump initiated and Trudeau supported. Around that time there were feminists that spoke out and said that the achievement of peace is not through bombs. If we’re going to talk about feminist policy, bombing is not the way to go about it. I believe that class is critical in implementing an intersectional feminist agenda — that’s been very important in our campaign. If we’re talking about a feminist agenda, then we’re talking about inequality that women face, that people of different genders — trans folks, non-binary folks — face because of their gender identity. That inequality is also about economic justice. Canada gets a lot of negative attention these days for its role in climate change through its extractive industries. What policies do you propose to meaningfully tackle climate change (as opposed to the Trudeau method of going to international climate conferences that are mostly just photo ops)? We’ve put forward a bold environmental justice platform. We’re calling for bolder emissions targets. Trudeau is continuing Stephen Harper’s approach to the environment in terms of targets, though the rhetoric is different. We’ve made it clear that while targets are key, we also need a robust plan to achieve them. Our program is centered on citizen power and taking on corporate greed. I’ve indicated that it’s corporate greed and neoliberal policies that has brought us climate change. We’ve proposed the creation of a crown corporation, Green Canada, which would lead the federal transition to a green economy both in terms of the production and delivery of green energy. That would involve partnerships with the provinces and indigenous nations. It would be funded through a public investment bank and overseen by a citizen’s advisory board, recognizing that it is the grassroots in communities that know best the impact of climate change in their regions; they know best how to deal with mitigation and how to direct the transition. These advisory groups would involve citizens, workers, indigenous peoples, people from industry, and climate change experts. It’s about having advice from the ground up instead of the top down, which has been happening so far from the federal government and isn’t getting us anywhere. How do you envision reassuring workers that this transition will not be too disruptive in their lives? First, I’d say that I come from a mining town. I come from a community that lives the boom-and-bust cycles. I know how difficult that reality is. I believe that the creation of good jobs needs to be at the center of our transition strategy. I also know that, given that boom-and-bust reality, many people want more sustainable work for their kids and their future. In our transition strategy, green jobs will be created through the crown corporation and investments in infrastructure. That’s key to creating opportunity for people that are concerned that they will lose their jobs or their economic security. We’ve talked about investing $10 billion annually in affordable housing that is comfortable and green, including forty thousand units per year of public housing and creating more than 150,000 homes in a first mandate. This is all part of tackling climate change while also creating good sustainable green jobs in order to get there. You’ve received a lot of attention for raising the issue of justice in Palestine in contrast to what is the mainstream political consensus in Canada. Could you discuss your position on it and your broader approach to foreign policy? In my campaign, I’ve talked about the need for the NDP and Canada to be a voice for peace in the world. For me, it’s been important to be a voice in the face of injustice in Canada, working with indigenous leaders fighting racism and colonialism in our own country. We need to be a strong voice in the face of the same kind of injustices abroad, including in Palestine. The situation in Palestine is becoming worse. We’re seeing escalating tension right now. Canada needs to be a strong voice in support of peace, against illegal occupation, against the illegal settlements, and for respecting human rights. That’s why I showed solidarity with those who were supporting the hunger strikers who were protesting the inhumane conditions in Israeli jails. I believe Canada has a role to play in the world in being a force for change, peace, and justice. Many inspiring activists across the country are doing great work on this front, decrying human rights abuses, decrying injustices, and putting forward a plan for change, including through the BDS movement. The NDP needs to be a strong voice in support of the work that so many activists are doing, a voice at the national level for Canada to be for peace and justice in Palestine and the Middle East. The relationship between the NDP and social movements have gone up and down over the years. Sometimes it has been fraught with tensions between movements and electoralism. How would you approach relations with social movements? Sometimes they are skeptical of political parties. My approach to politics has always been from the ground up, and my work has always been centered on taking direction and inspiration from social movements and grassroots activists. That’s been part of my career not just as a Member of Parliament, but as Status Of Women critic where I worked with feminist activists, in my work as Indigenous Affairs critic, and Youth critic where I dealt with post-secondary education, and most recently dealing with the issue of precarious work for millennials. The only way to achieve political change is through working with and taking direction from social movements. So many young people in particular are at the forefront of social movements that are calling for system change whether it’s environmental justice, Black Lives Matter, indigenous solidarity movements, or feminist movements; we need to heed these calls and work together. Anti-police-brutality movements like Black Lives Matter have focused a lot on the local or provincial level, but there is a federal police force in Canada, the Royal Canadian Mounted Police (RCMP). It has a long and problematic relationship with indigenous people. How would you use federal government power to deal with police racism and brutality? The federal government has a key role to play in changing the direction of the RCMP. Our campaign supports ending the RCMP’s practice of carding [similar to stop and frisk]. We also believe that as part of the Missing and Murdered Indigenous Women Inquiry, there needs to be an investigation into the role of the RCMP and law enforcement more broadly in the targeting of indigenous women. There needs to be a far more robust, independent mechanism for complaints and reporting in terms of the RCMP. Right now, many people are discouraged from reporting so because they don’t see the mechanism as being truly independent. We need to repeal Bill C-51, which gives the RCMP significant power in going against privacy laws in targeting indigenous, Muslim, and racialized communities. We need to put a stop to not only that approach, but also the culture that’s geared towards intimidating so many who are fighting against injustice in their communities. I see it as a comprehensive approach, a need to move away from a historically colonial approach to policing, to one where police have a role that is significantly different than today. The NDP was created through an alliance of the CCF and the Canadian Labour Congress (CLC). How would you approach the NDP’s relationship with the labor movement? The relationship with the labor movement is foundational to who we are as a party and it needs to continue to be. The priorities that we are fighting for are the priorities of working people. Now, especially among young people, there are a lot of workers who are not in unions. There is an emerging working class not tied to traditional unions. That’s why, for me, it’s been very important to focus on the rise of precarious work and support the emerging labor activism that we’re seeing across the country. Whether it’s the Fight for $15 and Fairness campaign or the workers in the Retail Action Network on the West Coast, there’s a real movement afoot, and we need to be tuned into this activism to demand justice for working people. You have a very ambitious tax plan. Could you explain some of its main points? We have a very exciting tax plan. I’m really proud that our plan has been seen as the most progressive. That’s because what we are calling for is making the rich and corporations finally pay their fair share. Working people and people that are struggling are contributing their fair share when it comes to taxes. Those that are getting off the hook are those that have the most. Whether it’s legally or through other means, they’re not paying their fair share. So we’ve called for increasing income taxes on the top 5 percent, particularly the top 1 percent. We’ve called for capital gains to be taxed at the same level as earned income, we’ve called for an inheritance tax, and an increase of the corporate tax rate to pre-Harper levels. And as a result, we’ve put forward a plan where we’ve identified $40 billion where we can then invest in key priorities like pharmacare, free tuition, dental care, and the kind of investments in infrastructure that we require. While some, particularly those in the mainstream, may say “how could you possibly pay for this?” we put forward a plan where we very clearly indicate how to do. It’s time for the rich and powerful to pay their fair share. There’s a debate going on within the Left involving universal basic income (UBI). You have made the case for strong social programs over UBI. Why do you think that’s a superior method to deal with inequality? Our campaign has made it very clear that tackling inequality means a strong social safety net. It means tax reform so we can invest in the priorities that matter, and in a system that has universality. So when we’re talking about pharmacare, dental care, or free tuition — these are universal programs that would lift everyone up. I do appreciate the ongoing discussion about UBI. But for me there are red flags, including that there are many on the Right championing it at the same time they support policies that seek to cut health care and education. That’s not an anti-poverty strategy by any means. It’s also clear to me that UBI, when discussed in the context of precarious work, doesn’t actually put an end to the rise of precarious work and automation. The way we do that is by challenging the neoliberal agenda: fighting back against privatization, proposing public ownership, stopping austerity, reinvesting in our public sector and social safety net, and saying no to bad trade deals. Our campaign has made it very clear that the way to tackle inequality is to lift everybody up by challenging the status quo and expanding our social safety net. Canada is one of the most decentralized countries in the world. There’s a lot of resistance today to large-scale national programs, often by the provinces. How do you deal with the other provinces, especially Quebec, on this issue? We’ve been told for the last thirty years that the federal government is not the solution. Instead, the government has devolved their responsibilities to provinces, municipalities, and First Nations. That’s left us in the lurch and also convinced us of this new normal where the federal government doesn’t have a role to play in a lot of key areas. We need to change that. We can’t deal with climate change if we don’t have strong federal leadership. Again, it can’t just be committing to targets, but having a way of achieving these targets. A strong federal approach is key to doing that. The way we’re proposing tackling inequality and tax reform is the purview of the federal government. There’s so much to be gained in tax reform where the rich and corporations pay their fair share. Only the federal government that can implement such a plan of social, environmental, and economic justice. I’m proud of the work that the NDP has done around the Sherbrooke Declaration, recognizing that Quebec has a unique place in Canada. We must respect Quebec’s jurisdiction and its different arrangements on delivering programs. That’s something that would continue under my leadership. I have talked to people who have been NDP members in the past but lapsed their membership; they are rejoining the party for your campaign. I’ve also talked to people that have never been members before that have joined for your campaign despite being skeptical of the party in the past. Going forward, what is your vision of how the party should function, especially on the issue of democracy within it? I’m very honored that so many people are coming back to sign up for the NDP after a period of disillusionment or disengagement, and also the way in which many young people are signing up for the first time. They really believe in the ideas and the vision that we are putting forward. At events across the country, we’re seeing more and more people coming out and momentum build. It’s really exciting. There was a young guy I remember that I met in June who said that he had worked on Bernie Sanders’s campaign, and that the kind of energy he saw at an event in Victoria was the kind of energy he saw when he was working with the Sanders campaign. That speaks to the fact that grassroots activists are coming together to rally behind a vision that is unabashedly progressive and unabashedly left. There is a hunger in Canada today for the vision and voice we are putting forward. Going forward, one of the ways that we can rebuild as a party is by engaging in democratic reform. That means spending more time on policy and principles than on polling and public relations. That means respecting and being in much closer communication with the grassroots, and ensuring that policy debates are taking place all over the country throughout the year. That we’re taking direction from different regions about policy and positions, and that we’re engaged with social movements. There will be some that take up NDP membership and others that don’t but still share our values. But we can still work in solidarity in trying to achieve the kind of political change in which we all believe. I’ve also talked about the need to put an end to the way in which our candidates have been treated in the past, particularly the way in which many candidates who supported justice for Palestine were turfed. That’s unacceptable and has no place in a party like the NDP. People who support justice for Palestine, who support justice for oppressed peoples around the world, are key parts of the NDP, and they subscribe to key NDP values. We should be proud those people are putting their names forward to run for our party. Obviously, we want to win elections and win government to affect change, but political change comes from the ground up. So working with those who are joining our party from the grassroots, those that have been part of our party for a long time — through this leadership race, we can come together to set the NDP on a different path, one that is much more connected to our principles, our roots, and the challenges of our time. I’m very excited about the reaction we’ve been getting, the momentum that’s being built, and the opportunity we have to build the movement for social, environmental, and economic justice that we all deserve. Niki Ashton is a New Democratic Party (NDP) Member of Parliament for the federal electoral district of Churchill—Keewatinook Aski in Manitoba, Canada. She is running for leadership of the federal NDP.